Explore a typical British riverbank with our brilliant fact cards. 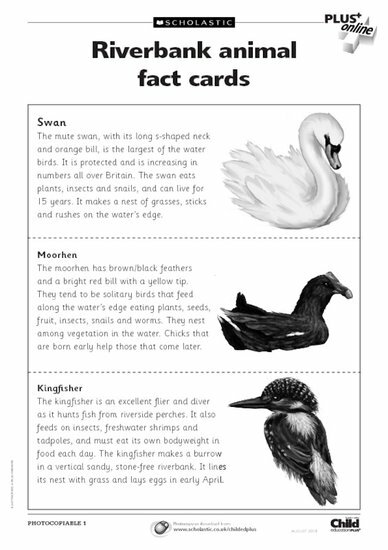 Use the cards as the basis for a discussion of each animal’s adaptations and the environmental issues affecting the river bank. Think about the differences between the creatures’ life cycles, how their habitats might change with the seasons and some of the dangers they might face. You could even see if you can map out a riverbank food chain. Primary members of the Scholastic Resource Bank can get instant access to this fact cards and thousands more online resources. Our finely crafted resources include lesson plans, teaching ideas, planning and assessment tools, activity sheets, interactives and video.